Electro Optical Components Inc. has a variety of fiber coupled laser diode modules for medical applications, Biophotonics, and Fluorescence detection. For precise applications the wavelength stabilized laser diode modules (±0.5nm) are available. They have laser diode modules with aiming beams. 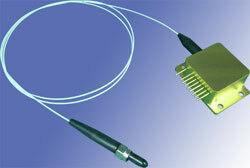 Narrow line width laser diode modules are also available. If you need dual and 3 wavelength laser diode modules, those options are available too. -Optical and radiation | -Sensor technologies / Measurement principles | -Optical, Optoelectronic, Photoelectric | All articles | Electro Optical Components, Inc.